I guess it’s inevitable that all good things do come to an end. My favorite recycled plastic bag tote is disintegrating. I crocheted this plarn tote bag back in 2007 so its 5 years old now. I use this recycled bag for groceries and produce all the time. A few months ago, the stitching started coming apart below the handle so I spliced in a strand of plarn and repaired the hole. 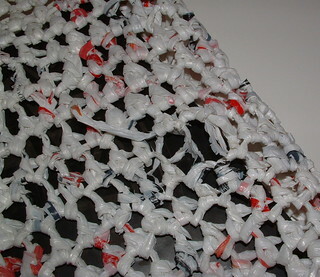 I could see then that the existing plastic bag yarn was very brittle and starting to disintegrate. Here is the latest disintegration of my plastic bag tote. I actually found another hole after I took this photo. As you can see the ends are very brittle and when I tried to weave the ends under, they just break off.